Fairfields farm – A family run business based in Essex contacted me to ask if I’d like to try their first ever microwaveable ‘Heat and Eat’ crisps – intrigued, I accepted their offer and was the lucky recipient of not one, but six bags just before Christmas. 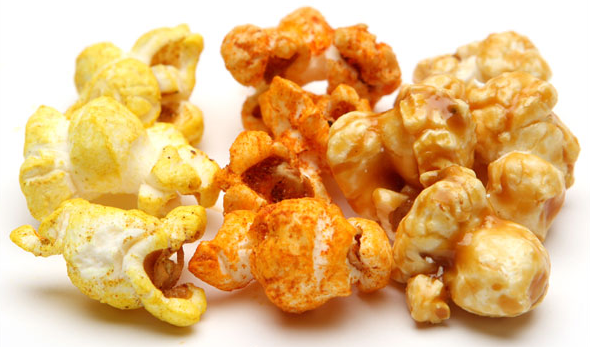 I’m not quite sure what I was expecting…if I’m honest, I thought it was going to be a bit like making your own popcorn, but couldn’t quite fathom out in my head how that might work…but I was wrong! Upon first glance inside a bag, I thought ‘they’re just crisps and this is all a gimmick’ – I tried one of the crisps before putting them in the microwave, and they tasted just like a normal crisp. But then, after zapping for 30 seconds, I dipped one of the warm cheese & chive (my favourite!) crisps in to the included pot of caramelised onion dip, and I realised then that they were just a little bit different – the heat brought out the depth of cheese flavour, and made the crisps even crispier…it also made the whole thing extremely moreish and I felt that we should finish the packet before they cooled down (probably not a good thing!). So, if you haven’t tried them yet, grab yourself a bag of Fairfield farm Heat & Eat crisps, and take them to your friends for your next get together…a talking point, and a delicious treat. A Thai Supper night with me! and Jane Beedle. Join us for welcome drinks, cooking demonstration and a 3 course Thai inspired meal as we take over The Chancery in Beckenham, Kent. How UTTERLY AMAZING does this place look?! I’m over the crowds in Borough, and although Bar Tozino is my little piece of Spanish heaven in the heard of London at Maltby Street, that too is becoming too popular and over crowded. SO – looks like I’ll be checking this place out v soon as a new foodie haven 🙂 If you go, let me know what you think. Would love to see some pics. 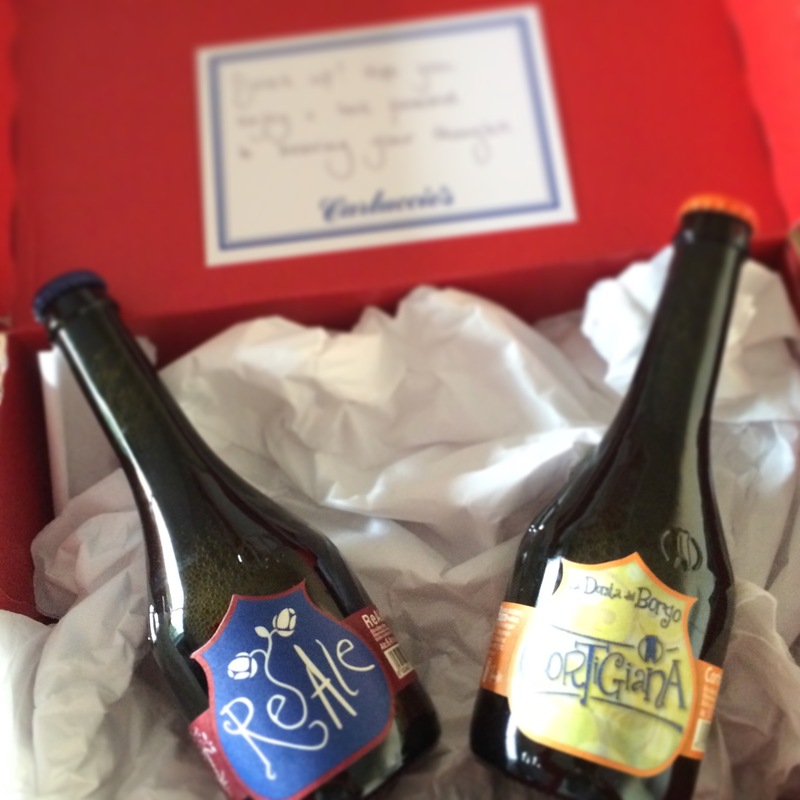 Carluccio’s have introduced two Italian craft beers to their restaurants. I was lucky enough to receive a bottle of each to try – ReAle was my favourite with a deep amber colour and fruit and malty taste leaving bitter notes in the mouth that went very well with the parma ham we were enjoying on our pizza. The second, Cortigiana had a much more yeasty after-taste and smell to it which I wasn’t a fan of but for those who enjoy a pint of Hoegaarden would probably love. 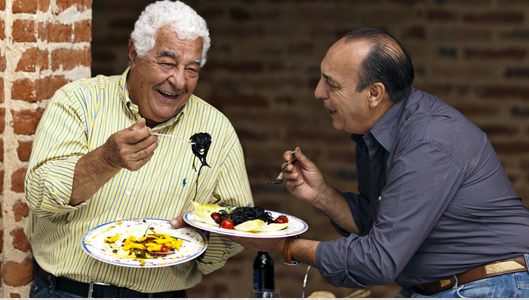 Pop to your nearest Carluccio’s restaurant and give them a try yourself. 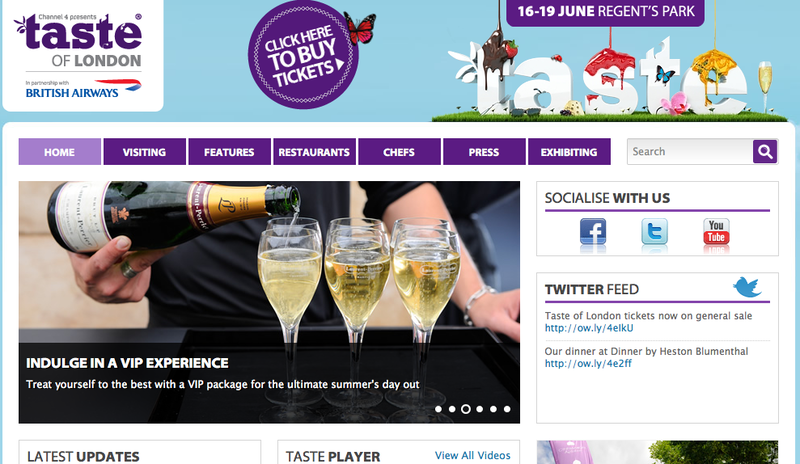 This looks AMAZING – check their site for events across the country and await sales of the London finals! 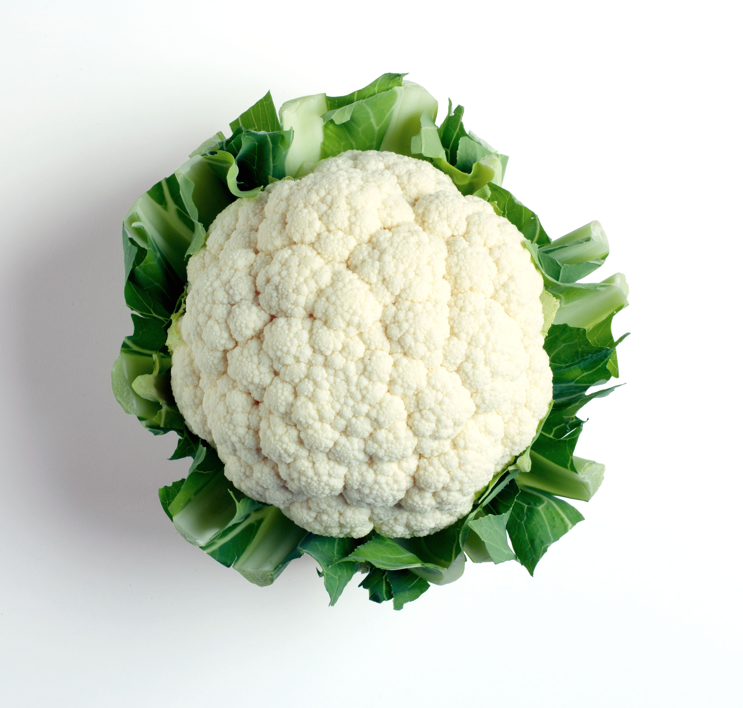 Food trends for 2015 – I LOVED cauliflower pizza base in 2014, so will be sticking with it for 2015. I attended the show on a Saturday with a group of cooking friends. We had a great day seeing the Godess of baking, Mary Berry being interviewed by Jo Wheatley, reading the baking tips shared on a line by the experts and bakers visiting the show. It had a great atmosphere and I picked up a nice haul of treats – from minature jelly moulds to some amazing gin and blueberry marshmallows from The Marshmallowists. I was a little dissapointed that there weren’t more ‘baking gadgets’ to be seen/had, but popping out for some amazing tapas and a glass of sangria at La Farola in Angel soon cured that. There were some fantastic cakes on display on the upper gallery (even a full life size soldier!) and I definitely left inspired to get my bake on 🙂 Bearing in mind that this is the show’s very first year, it can only get bigger and better next year. 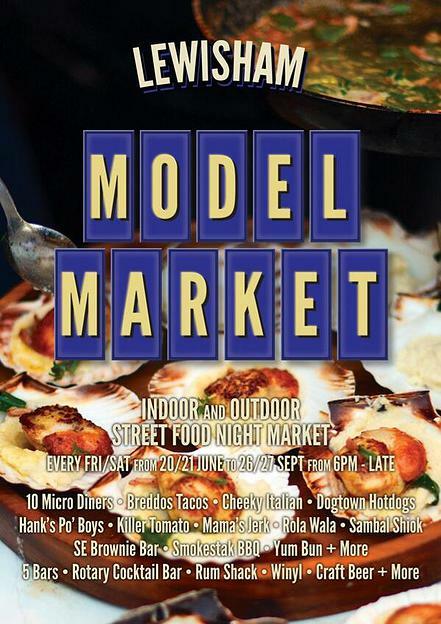 every Friday and Saturday evening Lewisham Model market serves up tunes, food, drinks and fun. I can’t wait to get down there and give those scallops a go! I’ve just ventured in to the wonderful world of weaning – a little premature and so completely unprepared, my overly hungry four and a half month old decided it was time. So what to do in a moment of panic?! turn to Annabel Karmel of course. I’m currently roasting, steaming and puréeing for the most important human being I’ve ever had to cook for…the pressure led me to burn pears on day one! 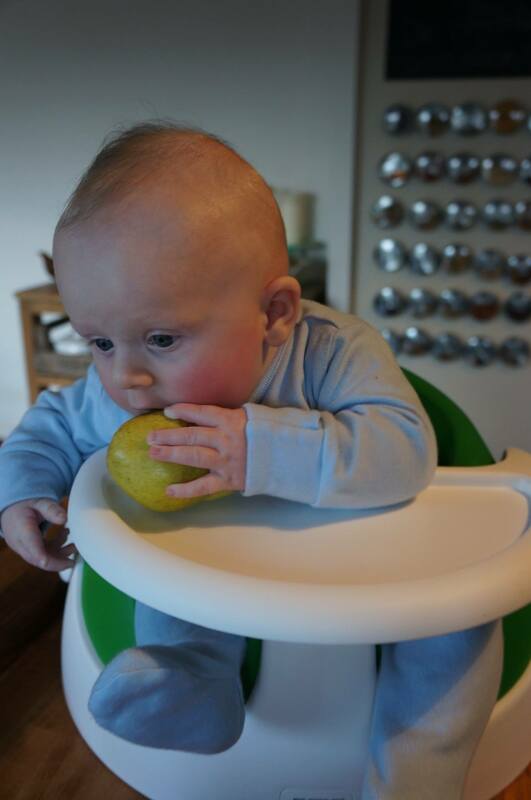 I’m keen to help my baby boy explore the adventurous world of food on his own terms and so am just about to embark on baby led weaning…Wish me luck, and any tips you may have will be gratefully received! 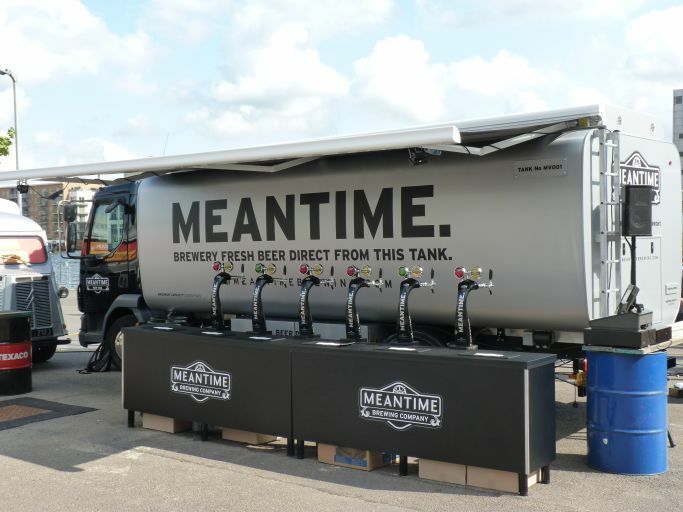 You could also be in for the chance of winning the ultimate summer party centrepiece, with an exclusive appearance The Beer Tank at your next event – check out the Meantime Facebook page www.facebook.com/meantimebrewing or check out @MeantimeBrewing on twitter for full details. Oh my goodness I’ve found my heaven… give me a mattress and a comfy chair and I could literally live in this place. A foodie day out with some great ladies that I met on a Facebook group called ‘Cooking Friends’ ended with a trip to Books for Cooks in Notting Hill. 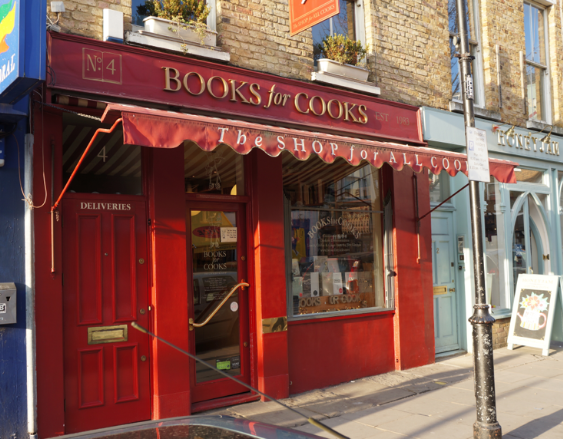 It’s right opposite the Spice shop – another foodie heaven and is literally packed with every cooking book you could ever imagine. 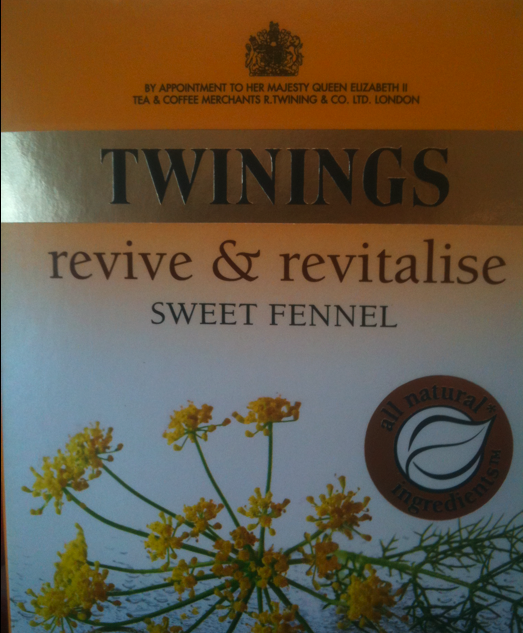 I found a great Foragers book that I bought home with me and am looking forward to reading with a nice cuppa. I’d certainly recommend this place – but perhaps best to visit on your own when you have a space half a day. There’s even a great coffee shop at the back of the book shop so that you don’t have to leave for refreshments. 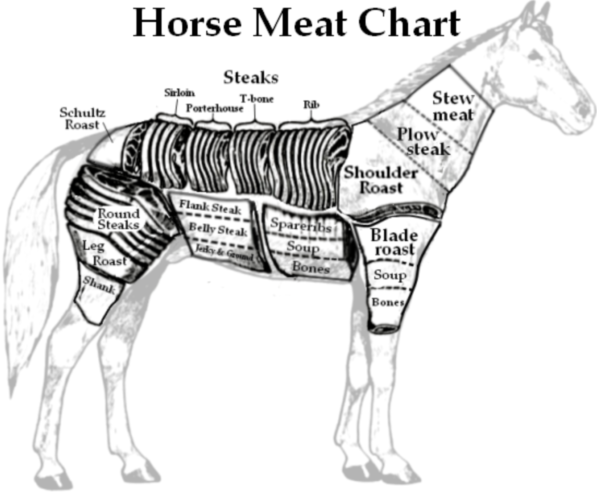 I’m afraid I take offence to a lot of the news items and response to the horse meat saga this week. Whilst I understand and agree with the general gist of what some are saying about the fact that if we put the pressure on for cheaper foods, then something’s got to give, I’m afraid that what I don’t agree with is blaming the public for lack of knowledge or an unwillingness to care. There are still a high proportion of people in this country that can’t afford to buy decent food. I grew up on a council estate with hard working parents and although we ate well and my parents cooked and passed those skills down to me through choice they still had to make choices around whether they spent their limited funds on a much needed new pair of shoes one week vs a quality joint if meat… And inevitably on most occasions the quality of food suffered – because the cheap stuff WAS available & otherwise it’d be bare foot or go hungry. We can all sit on our high horses and say these people get what they deserve due to their own ignorance or unwillingness to care, but when you consider a high % of the uk population are receiving a mere £70 a week because they’ve lost their jobs through recession and have to pay bills, clothing, travel and food from this then a £4 lasagne to feed a family of 4 becomes essential and their only option and yes, they may well eat it having to swallow the fact that the animal may not have had the best of lives or that they’re eating the primmest of cuts – but it’s NOT acceptable that they’re actually eating a completely different animal to that which is advertised on the packaging. THAT is the fault of the supplier or the governing body that’s responsible for ensuring our food is safe and correctly labelled. I wonder what the argument would have been should we have found out instead that the free range fillet steaks in Waitrose were horse?! 10. Grow your own – with food prices on the increase, and our new found knowledge to eat seasonally, this will only continue to ‘grow’ and ‘grow’. 11. Marshmallows – the new macaroon. 12. Eclairs – the new cupcake with all kinds of toppings and filling (not just your average chocolate and cream but strawberries and cream, butterscotch and all sorts). 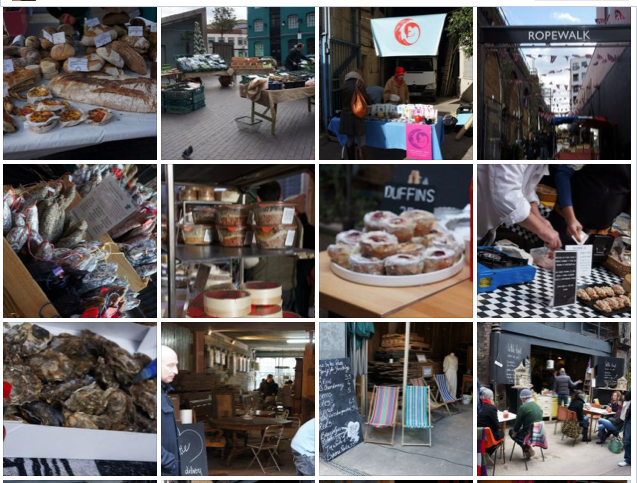 You HAVE to get yourself down to Maltby Street on a Saturday between 9am & 2pm… some amazing street food, bakers, veg and butcher stalls, the gorgeous Bar Tozino, and an outside gin bar with cosy blankets. The railway arches hold a wealth of foodie secrets at reasonable prices and without the heaving crowds of Borough market. Heaven. 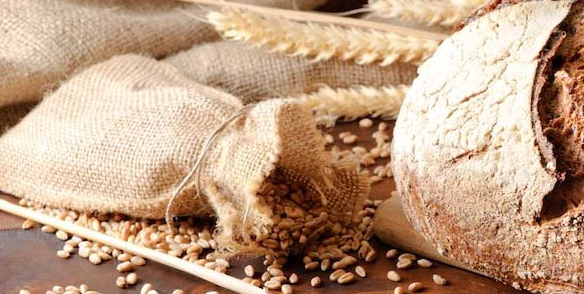 This weekend sees the Real Bread Festival at the Southbank Centre where the best bakers in the country will be gathering to sell their wares. 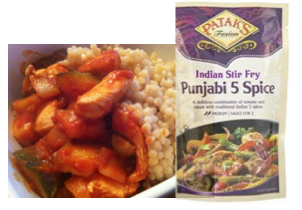 Patak’s have launched three new India stir fry sauces. I thought I’d give one a go for a quick ‘after work’ feed-up and rather enjoyed it! I used the Punjabi 5 Spice (medium hot) and added it to chopped chicken breast, a courgette, onions and a tin of tomatoes. Instead of serving with rice, I cooked up some giant cous cous, which gave a different texture and went down very well. Other new sauces to try in the range are Bengali coconut (mild) and Goan Hot & Sour (hot). 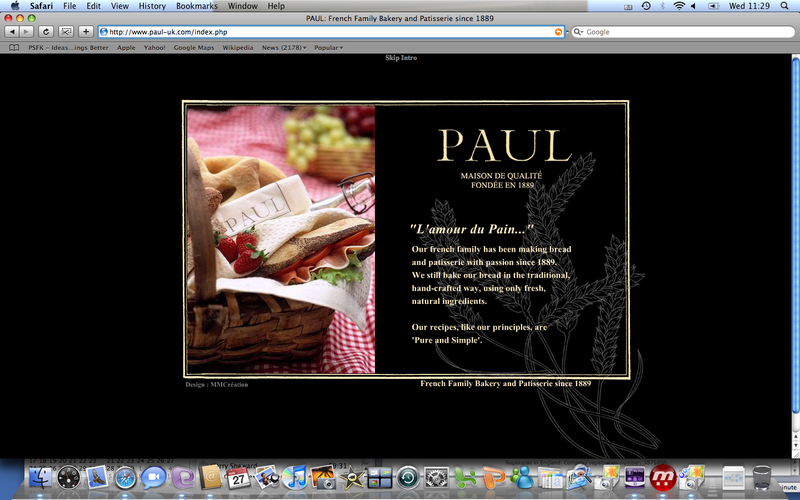 Visit Patak’s website for your nearest stockist. Today I was invited along to a sneak peek at the beautifully presented and oh so delicious treats that Carluccio’s will be selling throughout their stores this Christmas. 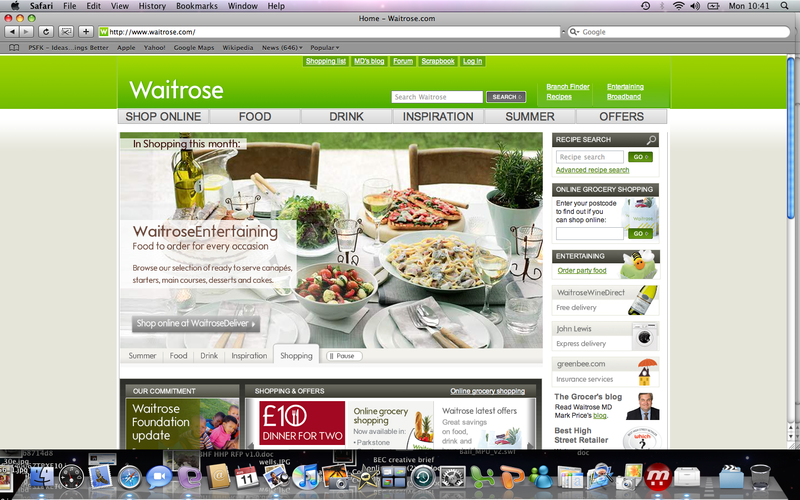 I’ve chosen what I want already – the Panatone and Prosecco gift box please! 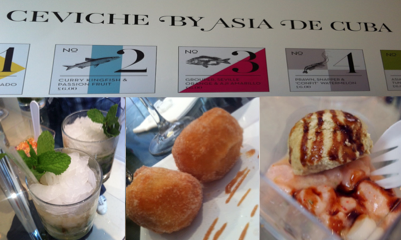 Whilst there we got to taste some of the delights of Italian cooking – wasn’t too sure about the deep fried pork belly! Got to see snow in July (mixed in with a little of the beautiful rain we’re having at the moment) and saw the big man himself – alongside a Campari bar. A lovely lunch that reminded me of how much I like Carluccio’s and just how quickly this year is going. I pass the St Martin’s Lane Hotel on my way home every night, and have been intrigued by many an interesting looking pop-up selling everything from Gelato to comics over the past 12 months. Finally though, Asia de Cuba have taken over the space – for three weeks only! to sell their amazing Ceviche ‘A creative blend of Spanish, Japanese and South American influences, combining raw fish, citrus and herbs’. They also have amazing mojito’s and hot. fresh doughnuts to die for…filled with a warm butterscotch sauce and served with a zingy mojito sorbet on the side. 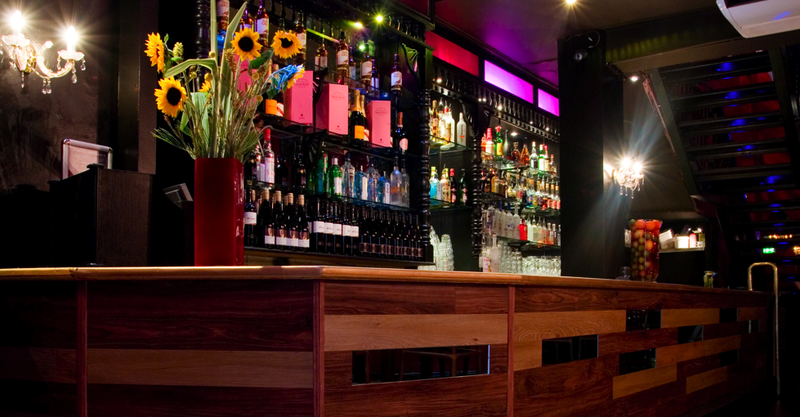 A great place to go for a quick ‘pick me up’ or starter before hitting the town. I’ve just signed up for my fundraising pack to run a Strawberry Tea, and can’t wait to get the invites out and the cake ideas flowing! 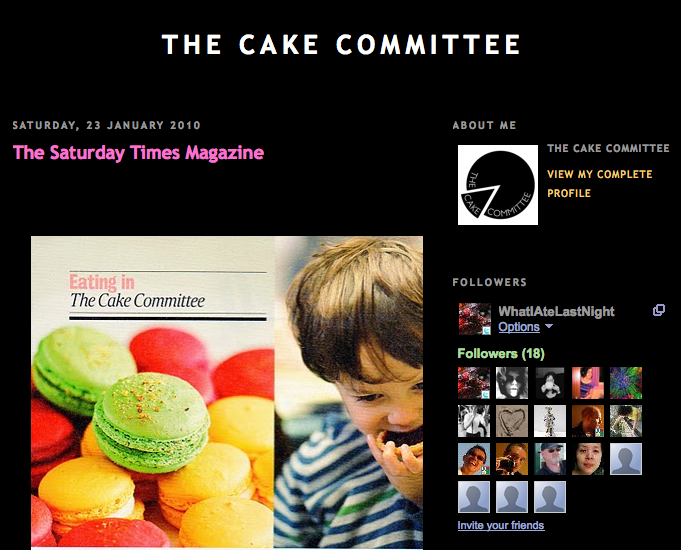 CCC’s are becoming very popular indeed, but I can’t help feel a little restricted by some of their rules, and as nice as it is to meet new people, sometimes it’s good to just have an excuse to catch up with your girlies, eat cake, drink tea… and feel guilt free about doing it. Money raised goes to Breast Cancer Care – a charity that’s very close to my heart, and one that truly needs and uses every penny for the good. If you’d like to run a Strawberry Tea, sign up here for your fundraising pack. 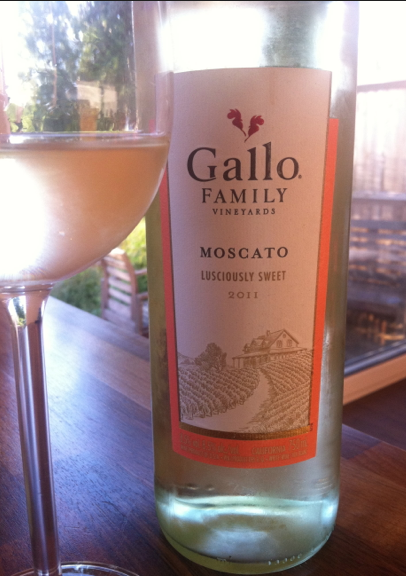 Gallo Family Vineyards have just launched a new Moscato – full of citrus and tropical flavours, this is a really lovely light dessert wine that we thoroughly enjoyed on a rare warm sunny evening with slices of fresh peach and Cornish Yarg cheese. I’d definitely recommend that you give it a go! Our ‘West Wickham newsletter’ arrived through the door this morning and had an ad from a local independent farm shop that I didn’t even know existed! We drove up to Layhams Road Farm Shop (a very windy and quite lethal road to approach on!) 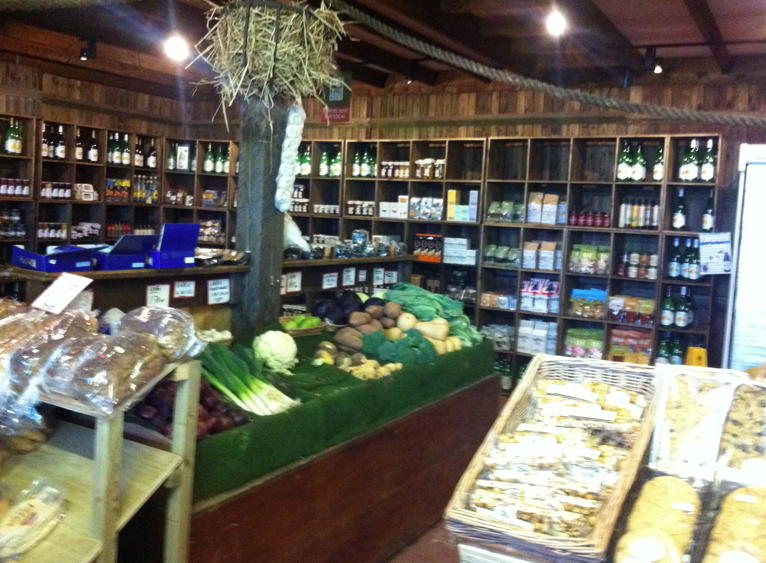 to have a look around, and I think I’ve fallen in love… my new foodie heaven 🙂 It sells everything from cheese, preserves and fruit, to plants and pet food. A few weeks ago, I got to try out a new independent home food delivery company. 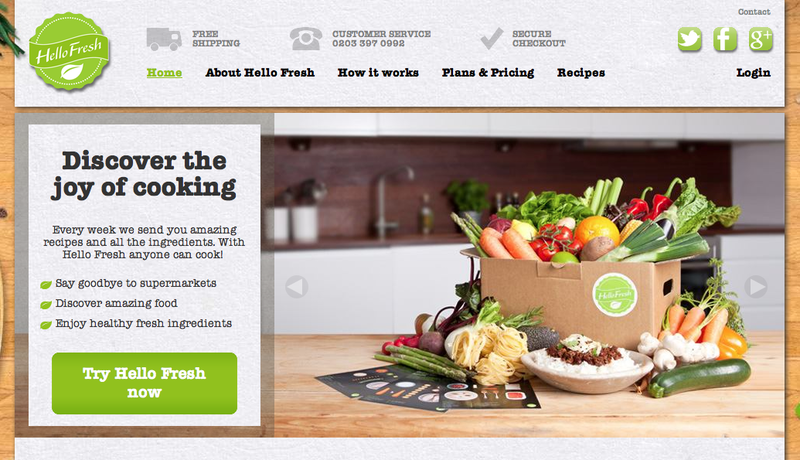 Hello Fresh offer a service whereby they create recipes, then deliver to your door all of the ingredients that you need make the recipe. 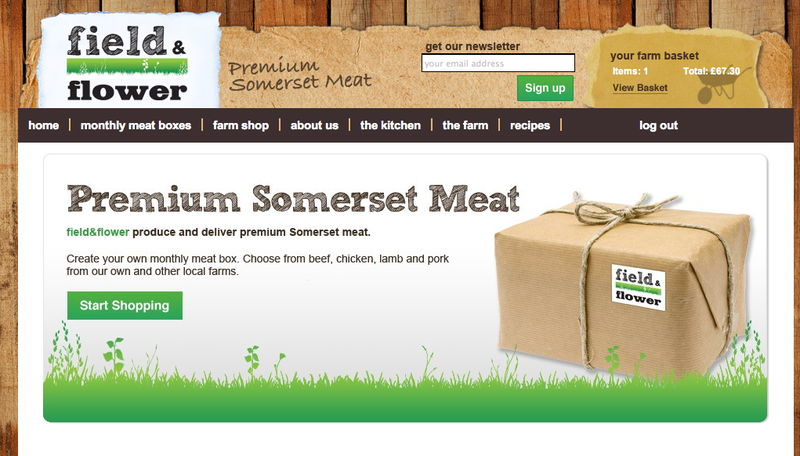 Subscribers can order a minimum of 3 meals per week, costing an average of £4.94 per person, and then receive a very neatly wrapped box containing exactly the amount of ingredients that they need to make up their mystery recipes. Hello Fresh decided that they didn’t want customers to be able to choose which recipes, as they want to ensure variety and a balanced diet. By doing this, they hope to try and convince people who may never have liked an ingredient before to change their mind based upon it being cooked/served in a slightly different way to what they’re used to. I really like the concept, and loved the recipes that we were delivered – my favourite being Spiced tomato Penne with Chorizo and Smoked garlic. A really simple dish to make that took around 10 minutes prep and 30 minutes to cook. We had just the amount of chilli measured out in to a little pot, a sausage of chorizo – rather than a hole string of them that would normally end up sitting in the back of my fridge until they’d gone off, and the correct portion of pasta, ready to just pop straight from the bag and in to a pan of water. The only things that weren’t supplied were the cooking equipment and a washer-uperer! We’re so excited about attending this event. 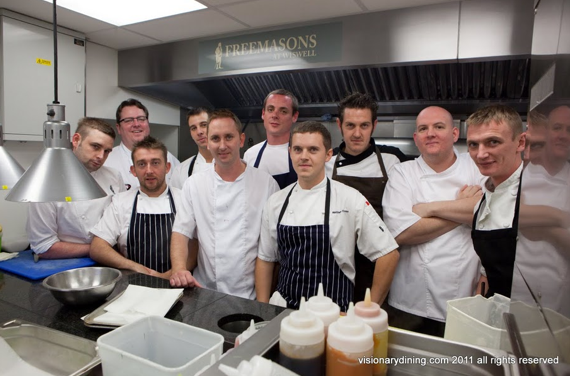 The prestigious national ‘Great 8’© series of charity dinners is a ground-breaking initiative between visionarydining.com and Hospitality Action. It features the following culinary heavyweights – Simon Rogan (L’Enclume, Cumbria), Aiden Byrne (Church Green, Cheshire), Michael Wignall (Pennyhill Park, Surrey), Alan Irwin (Lujon, Kent), Chris Holland (Alderley Edge Hotel, Cheshire), Steve Smith (Freemasons, Lancashire), Roger Hickman (Roger Hickman’s Restaurant) and Rupert Rowley (Fischers, Derbyshire). All will host an exciting and unique eight-course tasting menu at their own restaurant, each chef contributing one inspired course on the night, with events staged every two months around the UK. The next event is taking place at Lujon, Keston in November 2011 and provides a challenge to the chefs with menu headers such as ‘Liquid’, ‘Feathers’, and ‘autumn’ set to stimulate both the imagination of the chefs and the lucky 80 ticket holders at the next event. 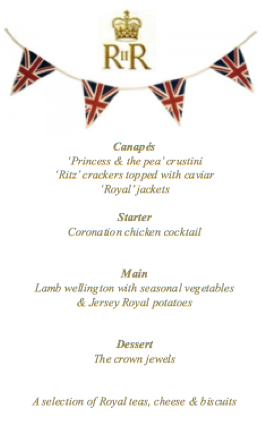 Tickets are priced at £100 per person, including a specially selected wine package. 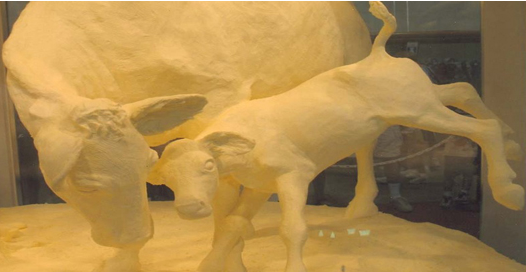 It’s their an annual edible exhibition with a scenic explosion of food art – the exhibition will culminate in an extraordinary banquet finale at which diners feast on the artwork whilst enjoying a night of food related performance. Loving the look of these guys…. 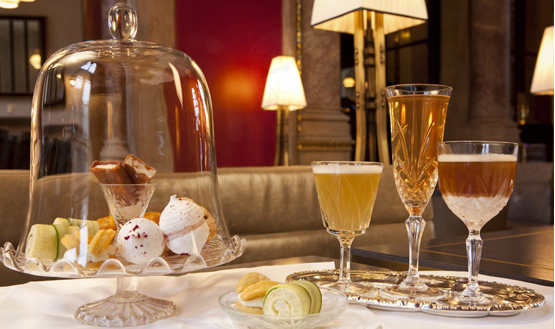 Join us for our tea inspired cocktail afternoon tea, Taking tea with George. 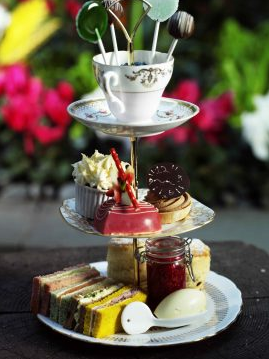 Enjoy the wondrous space Sir George Gilbert Scott created whilst sipping cocktails and sampling afternoon tea bites. With tasty treats such as Mrs Beeton’s cheese butterflies, Eccles cakes and peanut caramel choc ices, paired with the perfect tea cocktail. Daily from 12:00pm to 4:00pm in the bar, £29. After 11 years, we finally decided to tie the knot. With neither of us being particularly religious, and our love for the seaside and great food, we decided to break with tradition and have a typical English Seaside wedding. Friends and family gathered at The Lobster Shack, East Quay in Whitstable where we had our wedding ceremony upstairs at 3pm. A perfect, intimate service that was followed by sunshine, oysters and champagne out on the pebble beach and then back inside for a dinner of Ploughmans (served of course with Picallili and Tomato Chili jam from The Great British Pantry) Fish and Chips, and then an ice cream van where Robert and I served our guests with 99’s and oyster wafers. In the evening we opted for a Hog Roast (with mushroom risotto cakes for the veggies) courtesy of Hogs ‘n’ Kisses and our wedding cake (made by Strawberry Shortcakes) was Chocolate sponge with a chocolate buttercream and topped with an oyster shell and pearl instead of the traditional bride and groom. We had the most amazing singer and DJ, and danced our little socks off until 1am. We can’t thank the staff of The Lobster Shack enough. 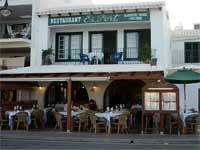 Their calm professional manner, along with their attention to detail, great food and great service was so amazing. We truly did have the best day of our lives. The foodies festival couldn’t have been held on a better weekend – perfect weather for a moving picnic through the many stalls (and a jug or two of Pimms!). With a healthy number and variety of stalls we sampled chocolate, some fantastic cheeses, scrumptious cakes, curry sauces, pastries, liqueuers, sweets and even some freshly shucked oysters. 1. The Little Round Cake Company who made delicious white chocolate and raspberry layered cakes. Our favourite of the whole day. 2. King’s Ginger fiery ginger liquer. One word – yum! 3. Another favourite was the Goody Good Stuff sweets stall – absolutely delicious sweets made from all natural (and gelatin-free) ingredients. 4. Some cracking cheeses were on offer from the Oxford cheese Company, especially their Spitfire cheese. Wow. 5. A special mention has to go to the Hendricks gin stall, which greeted us on our arrival to the festival and sent us home in good spirits! The poem created by Edward Mackay at the We Eat Poets evening. Click here to read the review. 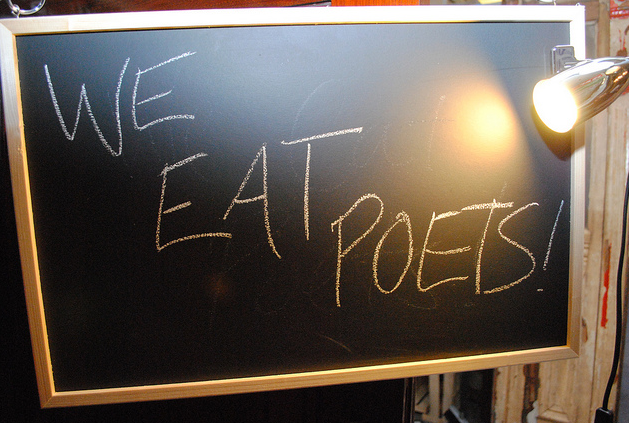 a poem written and performed at the second edition of We Eat Poets! Between the capo and the fret. Between the chime and chink of fork and knife. between the friends, the lover, husband, wife. and the humming buzz of hammer drum. Between the wine card and the fizzed head’s spin. Between the finger-picked dried meat and blue-veined strum. and the brick-built hall in which it’s hung. Between the flesh and feast and flesh again. Between the box of cheese and deep-filled lung. Between the peel of green paint and the forming face. Between the junkyard and the auction house. Between the candelabra’s bulb and candle’s tongue. Between light-headed, merry, tipsy, drunk and soused. Between the formal fold of card and fresh print’s change. Between the written word and throw of voice. Between the Suffolk Gold and Old Spot shoulder. Between the savoured, rum-soaked word and sudden choice. and the pear-slopped stink at the periphery. in Vauxhall, between salt-dried cod and sea. We were fortunate enough to attend last nights launch party with Kanaloa and Gallo for Gallo’s new Summer Red wine – a sweet fruity red, served chilled and also great as a spritzer, or served in a cocktail with blackberries, Chambord and lemonade (as we found out last night!). It was a star studded event, with Pixie Lott, Jo Wood, Alice Dellal, Henry Holland, Francesca Hull, Gabriella Ellis, Natt Weller, Leah Weller and last but not least Diana Vickers and her fella George Craig. Holland and Vickers took to the decks whilst tasty canapes of mini cheeseburgers, fillets of lamb and caramelised onion pastries were handed out on the roof terrace, overlooking Hyde Park. 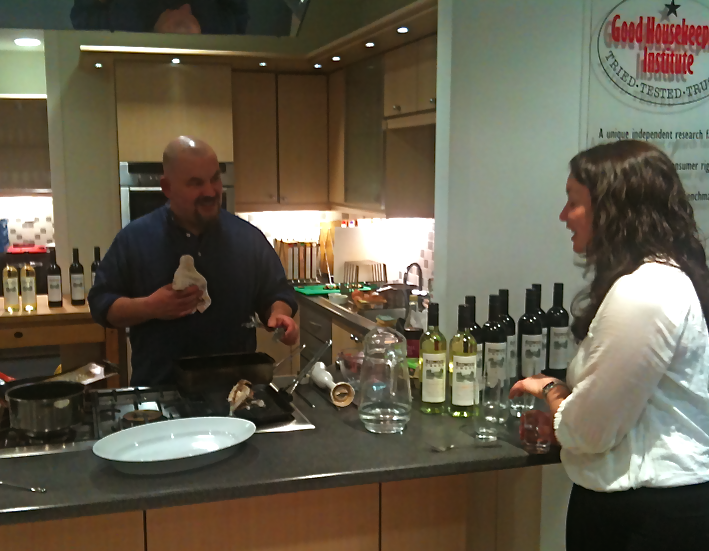 A very enjoyable evening had by all – thanks Gallo! I’m not your typical ‘Cruise’ target audience, but the thought of spending a week sunbathing, eating and drinking surely appeals to everyone?! Lots of celebrity Chefs are partnering up with companies to add credibility to their menus on-board, like Gary Rhodes and Marco Pierre White for P&O Cruises, and now Antony Worrall Thompson joins four other top European chefs to run a series of special themed cruises with MSC Cruises. Antony will be joining MSC Splendida on her 8 day, 7 night cruise departing 4th February 2012 (Genoa, Barcelona, Valletta, La Goulette (Tunisia), Civitavecchia (Rome), Marseille, Genoa). Prices start from £539 per person (cruise only). A little birdie tells us that this beauty is on it’s way to the UK! FOLLADOR Wines are a family owned business and have been successfully making wine since the 18th Century. Specialising in Prosecco Valdobbiadene Wines, FOLLADOR are well respected and one of the premier Italian Sparkling Wine producers. We first tried their delicious Prosecco at Fernandez and Lelu’s Supper Club and can’t WAIT to have it again… watch this spot for announcements of retailers and trendy-wendy bars that will be stocking it shortly! 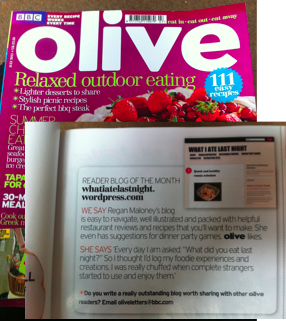 This months insirpation HAS to come from Olive magazine… because we’ve just been featured on page 9 as ‘Reader Blog of the month’ Eeeeeeeeekkkkkk!! 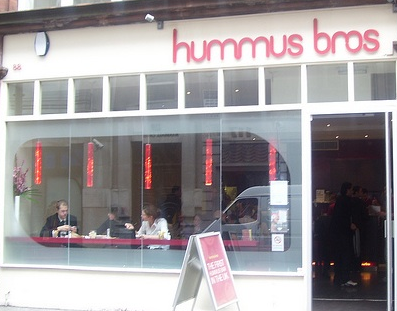 Hummus Bros and Cancer Research UK are teaming up once again to offer Londoners the opportunity to dine without spending a penny – all while raising money for charity. Barter for your meal by bringing in clothes, DVDs, household goods and other quality goods for Cancer Research UK’s charity shops to sell. A Cancer Research UK charity shop expert will assess donations and the equivalent value can be used towards food at Hummus Bros.
Award winning California wine brand, Barefoot Wine, has announced the arrival in the UK of its delightfully sweet Moscato. Reasonably priced at just £6.49 in Tesco, it’s delicious Apricot and peachy flavours go so well with a nice big bowl of greek yogurt and honey – or any dessert for that matter! Go on – treat yourself, or bring something different to the next dinner party that you go to! They’re WILLING me to buy them…. Let the Curry Festival commence! 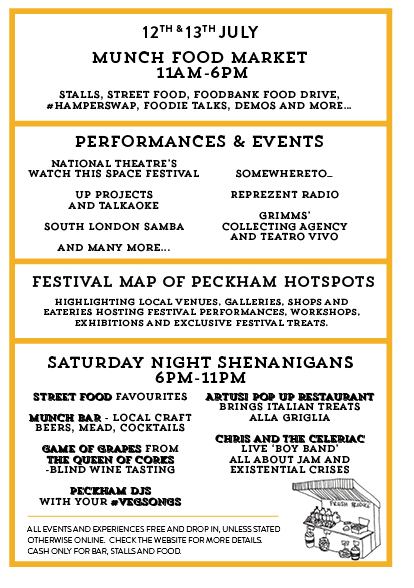 The Festival will kick start on Sunday 8th May in con-junction with the Baishaki Mela (Bangladeshi New Year Festival), which will see Brick Lane transformed in to an outdoor al fresco dining experience. Up to 40 participating restaurants will treat curry lovers to a street party with tables, chairs and stalls lined up to enjoy the special dishes cooked up by the talented chefs. 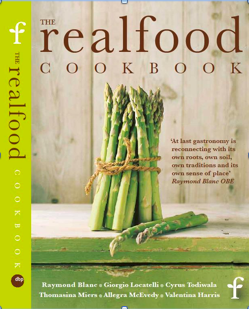 Book tickets online now and get the free Real Food Festival cookbook here. With only two weeks to go until the Real Food Festival at Earls Court, we’re clearing out our fridges and dusting off our freezer bags to make space for the delicious food items we’ll be buying there direct from the producers. The new addition for this year which we’re most excited about seeing is the Butchery Demo Theatre, being hosted by Allen’s of Mayfair where they’ll be imparting some of the skills and knowledge built-up over their 120 year history. The demonstrations will include sessions on how to butcher Lamb, Beef, Pigs and more, as well as the Allen’s of Mayfair stall for visitors to purchase some of their exceptional produce. 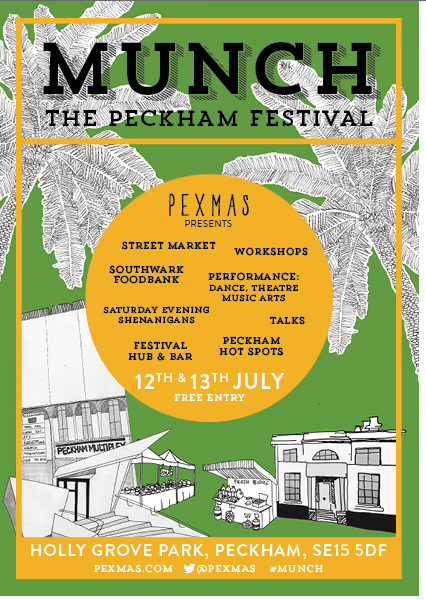 Advance tickets are just £13.50 or £19.50 – inclusive of the brand new Real Food Cookbook, kids go free courtesy of Sacla. 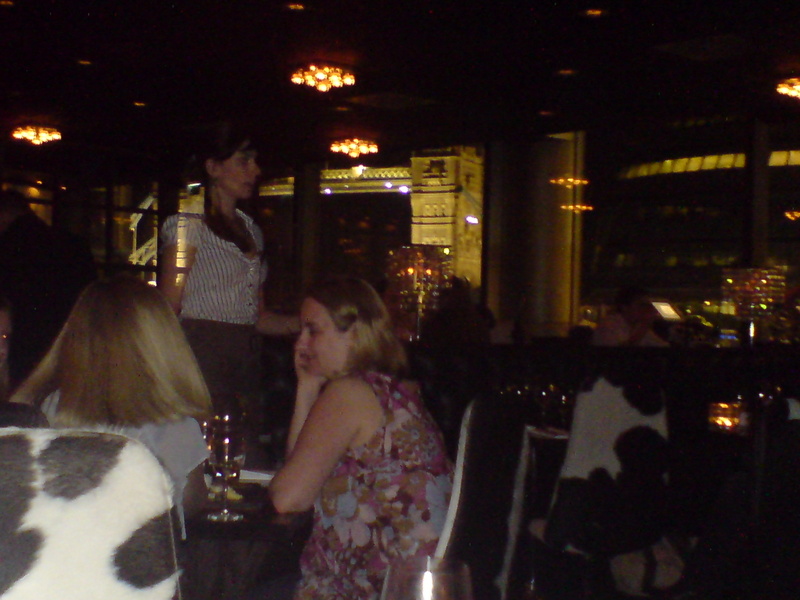 You may have read my recent review of Fernandez and Leluu’s Supper Club? 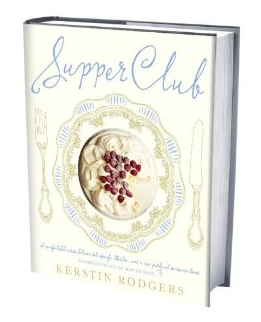 If so, you’ll know how completely in love I now am with the idea of Supper Clubs, and so Kerstin Rodger’s (AKA Ms Marmite Lover) book couldn’t have come at a better time. Although I’m not brave enough to want to start one up myself (just yet), I loved every minute of reading Kerstin’s accounts of endless evenings entertaining and feeding complete strangers in her home. Another bonus for me, is that Kerstin is infact vegetarian, and so although there are guest recipes from other Supper Club owners, all of her recipes are veggie friendly (although some also include fish). Please don’t be mistaken into thinking that I myself am a veggie – I LOVE MY MEAT! but I often have vegetarian friends over for dinner parties and spend weeks frantically trying to find something that doesn’t feel like they’ve just been handed a load of side dishes, or that something makes for an interesting menu that everyone would be pleased to enjoy. This book takes a lot of that hastle away. I own almost a hundred of recipe books, from celebrity chefs to strange little finds in second hand shops, but I can safely say that I’ve never bothered to actually read any of them all the way through from cover to cover. I tend to just use them to flick through and get inspiration/ideas. However the Supper Club was different. I didn’t want to put it down, and read the whole thing in just two days. It takes you through the 12 steps of setting up a Supper Club, the hard lessons learnt by Kerstin, a brief autobiography of her foodie life so far, and contains lots of great sounding and unusual dinner menus and recipes, as well as top tips… like how to make a bowl out of ice and flowers! Don’t think that you have to have been to a Supper Club to be able to enjoy this book, but expect to be gagging to want to attend one after you’ve read it! Photo’s of Kerstin’s kitchen make it look more like a creative artists studio with her Aga as the main masterpiece than just a home kitchen, or clinical restaurant kitchen. In summary, Kirstin sounds like an amazing lady, who loves her daughter, her cooking, socialising and her Aga very much indeed and I can’t wait to try out a few of the recipes from her book myself, and to hopefully attend her Supper Club in the near future. The beautifully illustrated Supper Club will be taking pride of place on my dining room dresser for all to see and enjoy. 2. A nice cold Chardonnay goes REALLY well with mackerel, and the Redwood Creek one is especially nice because it has a slight oakyness, which seems to disappear once the taste of fish brings out the fruity flavours in the wine. 3. Redwood Creeks Pinot Noir goes really well with smoked Venison – Smoking meat and aubergines being another top tip that I learnt from Mat! 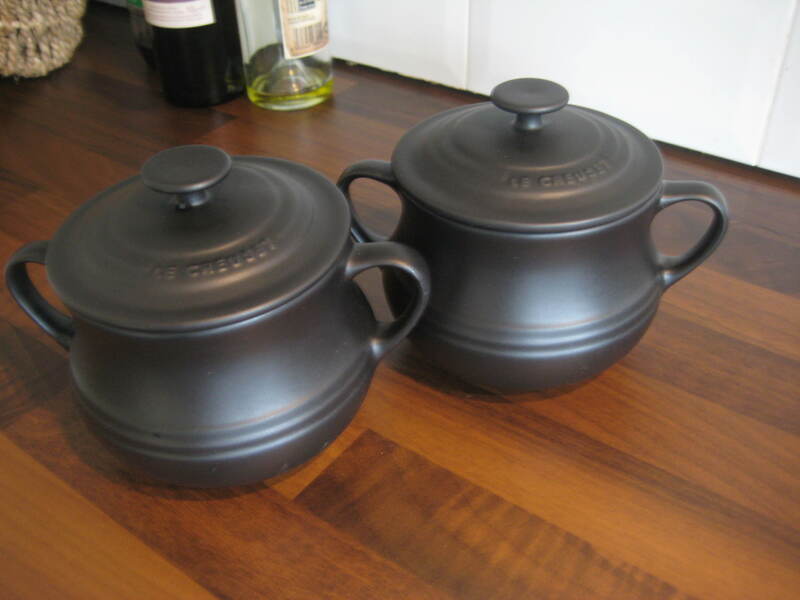 He used one of these stovetop smokers… another thing I’ll now be giving a go! 4. The label on the Redwood Creek bottle shows Redwood Creek in California – apparently where the water is taken from to grow the grapes that go into the wines. There’s nothing more special than a spot of shopping in London, followed by afternoon tea with the girls and so I thought I’d list below a few that were recently featured in Stylist Magazine. 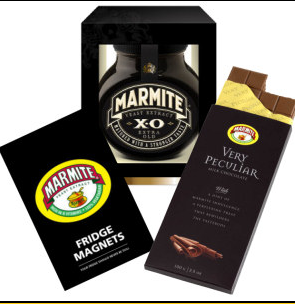 Have you tried the new Marmite chocolate bar?! If so, we want to know what you think…. 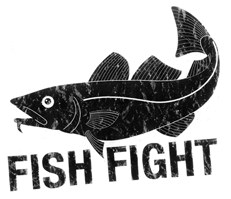 Lets start the New Year by doing something good… write to your MPs, sign the petition and get onboard with Hughs Fish Fight. There’s absolutely no reason why fisherman should be made to throw back dead fish to the seas. Things need to change, and our Government need to make it happen. 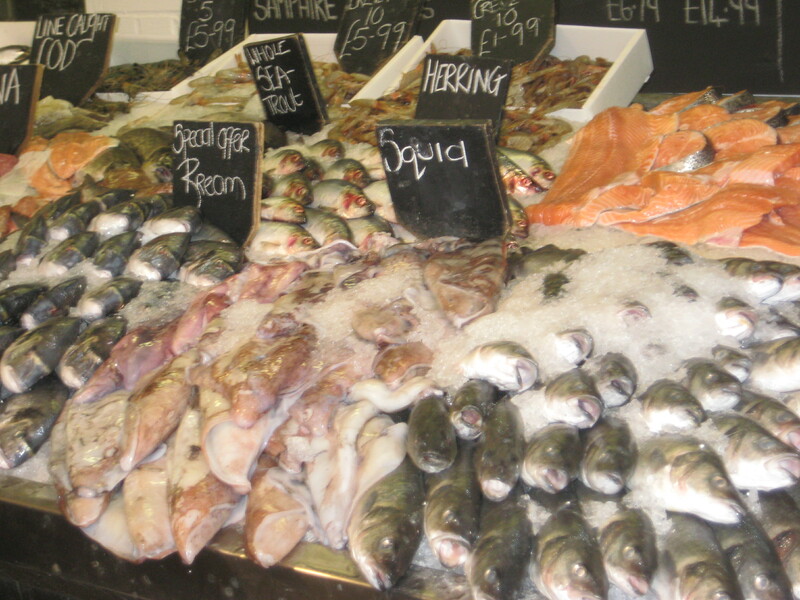 do your bit by making sure that it does, and by buying something a little different and tastier to cod! 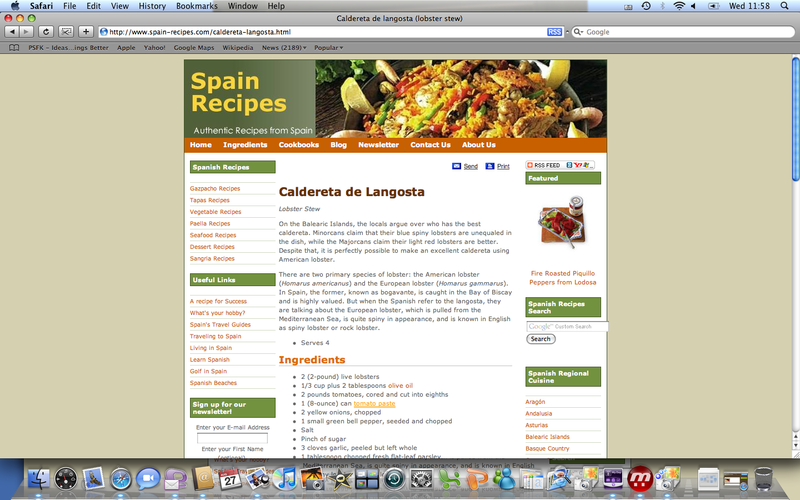 I’ll be posting up some lovely mackeral and coley recipes over the next few days to help you try! See a piece written by Becca in support of this. 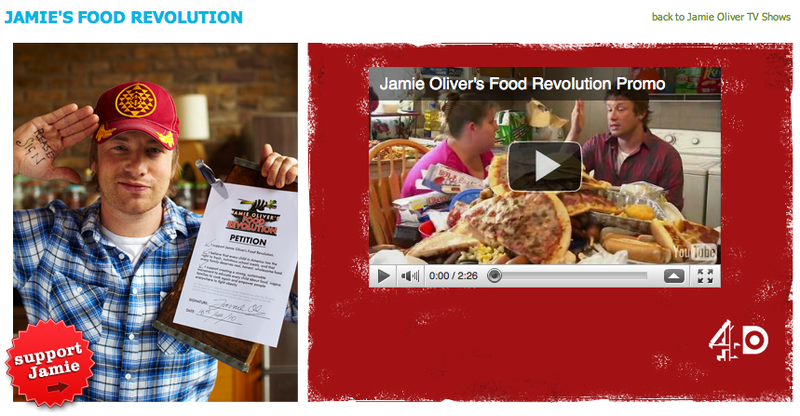 All food bloggers should come together to support this fight. Let the cupcake competition commence! What I Ate Last Night will be on the judging panel of this exciting competition, so get your seasonal creative juices going and get baking!! Visit tesco.com/food for entry details and if you need any help with recipes or further decorating tips click here , or get in touch with us at What I Ate Last Night and let us know what it is that you need help with. 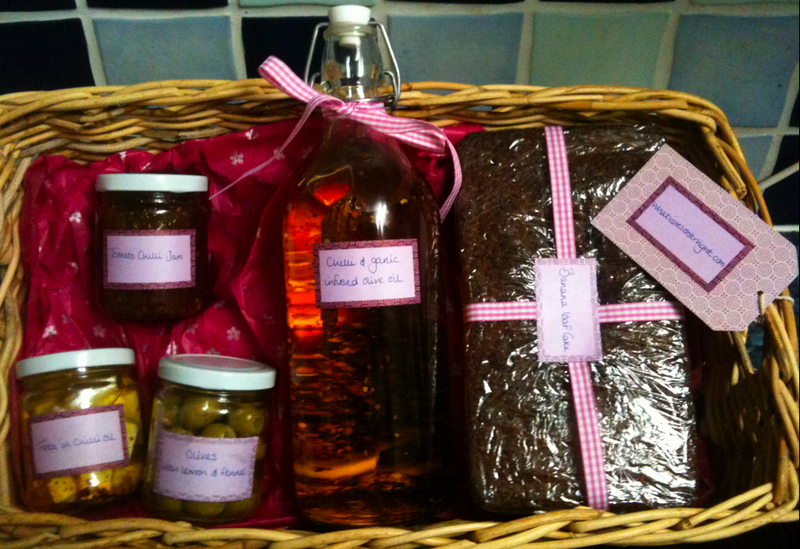 Home made Christmas hampers from The Great British Pantry! These are AMAZING – they come beautifully packaged, taste gorgeous, and you can order online and even pretend you made them yourself! Every Wednesday during the Summer, Zebrano, 18 Greek Street will be placing no price tags whatsoever on their food menu – customers just pay what they believe the meal they were served is worth – it is all in the hands of the customer! Zebrano want their customers to believe they are getting a fair price and they believe this is a great way of demonstrating this. 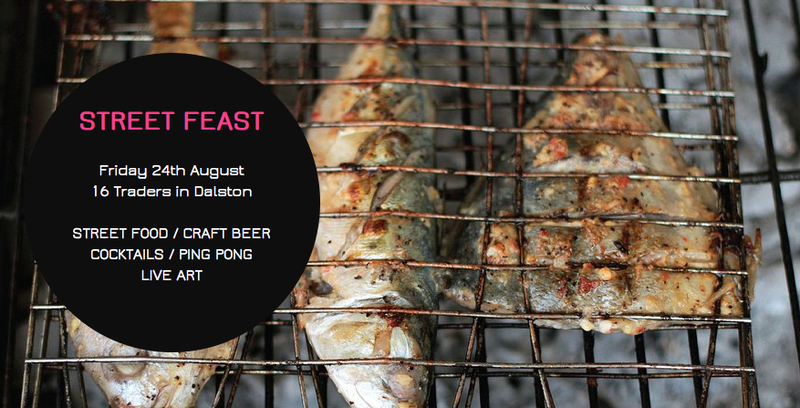 Get yourself down there for a taste of summer! There are some great days out suggested in the Rough Guide to Accessible Britain – and it’s FREE to Blue Badge Holders! A great day at the Real Food Festival – it’s even bigger and better this year. I’d strongly recommend that you pop down tomorrow (the last day) if you have the day off and want a great day out. Pate Moi, St John and Dolly Smiths pickles and Galileo Farm were just a few of my favourites. I was lucky enough to be invited to the launch of Platform – a new bar and restaurant that’s opened in Tooley Street. It seems like a great place to go for either pre-club cocktails, for a bite to eat in the bar area, or for fine dining upstairs. 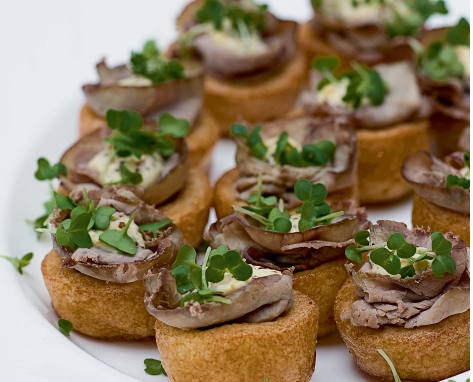 Canapes were nice, and the crowd and atmosphere at the launch party was great – watch this space for a full review soon. Write a message of support for Phil Packer, Catherine Bull and everyone else who will be completing the London Marathon this year. Phil and Catherine’s challenge is to help raise awareness of children with arthritis – a great cause that needs support me thinks! The Ideal home show was great – a nice mix of gardening, food and household inspiration. Highlights included a garden made entirely of chocolate, the Ideal Village by Anglian Home Improvements -affordable yet high tech living for first time buyers, three bedroom homes with open plan living, a traditional town house and ideas on how to update your existing home and reduce running costs. 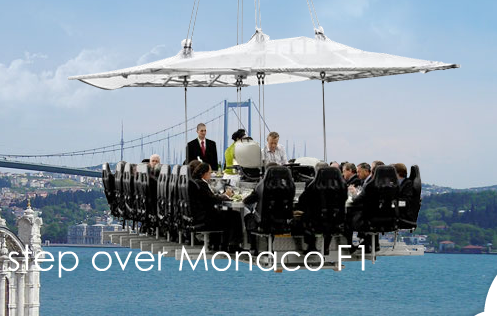 My favourite though was the floating office, located in the central marina. I’d love to have one of these! The show is still on until 5th April, so get yourself down there for a day of teasing, playing and inspiration. 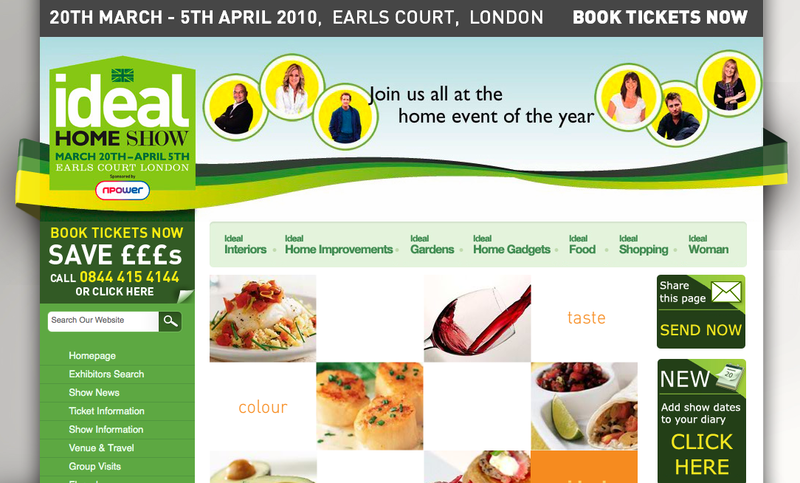 THE IDEAL HOME SHOW STARTS TODAY! We’re off to attend the Ideal Home show today. It’s on at Earls Court, London until 5th April so if you haven’t already got your tickets, book them now! 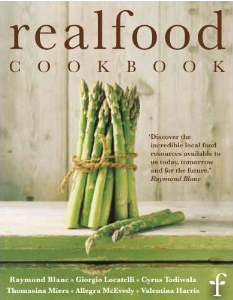 Real Food Festival – tickets now on sale! This was such a brilliant event last year. 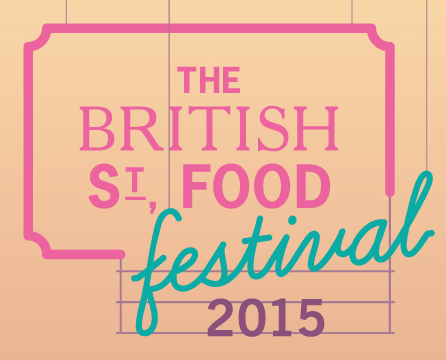 I’d strongly recommend that anyone looking for foodie inspiration, or just a great day out get their tickets booked! It’s on at Earls Court between 7-10 May. 24th November- New Cocktail Bar opening! I’m privileged to have been invited along to a sneak preview of the soon to be opening Black and Blue’s cocktail Bar on Berners Street, London tonight. Will let you all know what it’s like tomorrow, and details of when it’s open to follow. ‘Indulge in an exceptional Christmas-shopping experience and discover an eclectic mix of exquisite and desirable products ideal for Christmas gifts from elegant fashion accessories, stylish products for your home, something decorative for your table top to the ideal gifts for men and children, plus unusual spirits, fine wines and Champagne. Click here to find out more, and book tickets. I sooo want to buy this Ladurée box with macaroons (or have someone buy it for me!) they’re going to be on sale at the fair – hint, hint! I love autumn time because of the great hardy veg that’s around – squash, sweet potatoes and turnips are all essential items for your autumn veggie basket. 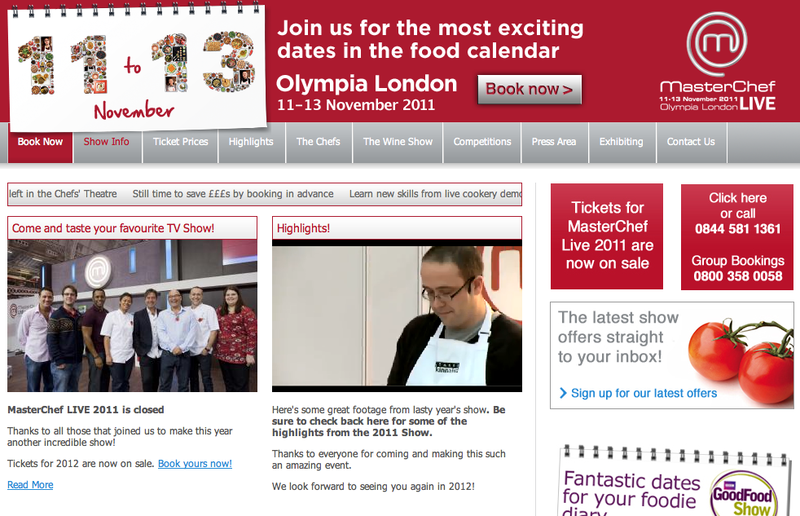 Congratulations to Maria from SE London, and Leanne from Kent for winning the CIRIO competition. 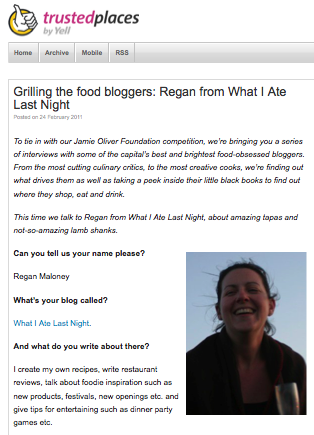 Their winning recipes will be posted on the blog for all to enjoy and they’ll be receiving their goody packs of CIRIO products and recipes from Whatiatelastnight.com. 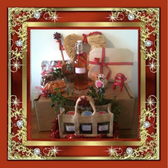 Many thanks as well, to all of you who kindly sent in your entries. We had great fun trying out your delicious dishes. I’ve just received the ‘Ciao Tuscany’ cookbook and can’t wait to try out the recipes. This week I’m going to be making the ragu pork with polenta, and naked ravioli with spinach and ricotta. Unfortunately us Brits miss out on the duos amazing looking restaurants that are scattered across America, but the book is available to buy online at Amazon, and so at least we can re-create the dishes at home! A hidden gem that instantly takes you back to your childhood in the heart of Soho. Mrs Kibbles has every kind of old fashioned sweet that you could imagine – including my favourites of banana and custard, army and navy and Wham bars. Great as a reasonably priced Friday treat to yourself or the office, and you can buy large jars of mixed sweets as a gift for your friends and family. 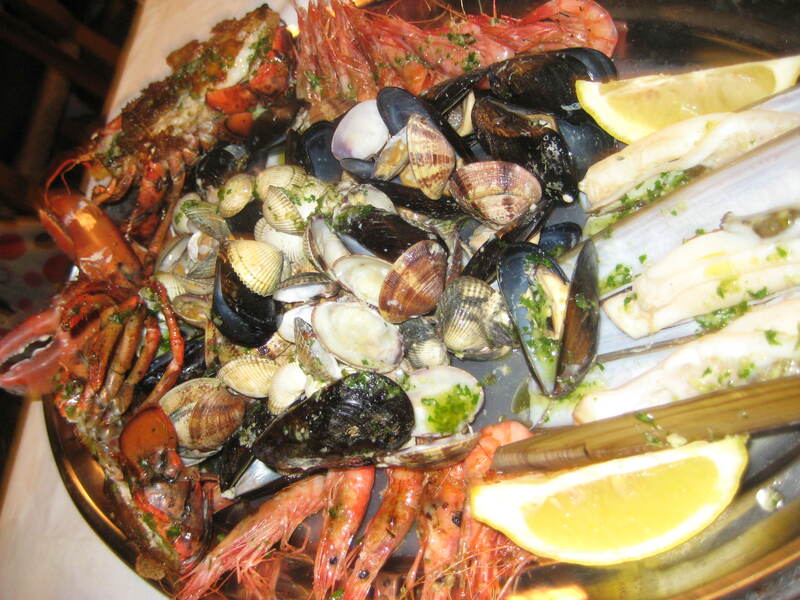 There’s nothing like a trip to Spain to get the foodie juices flowing. Serrano hams, tapas bars and paella by the sea, all capture the essence of summer and good living. 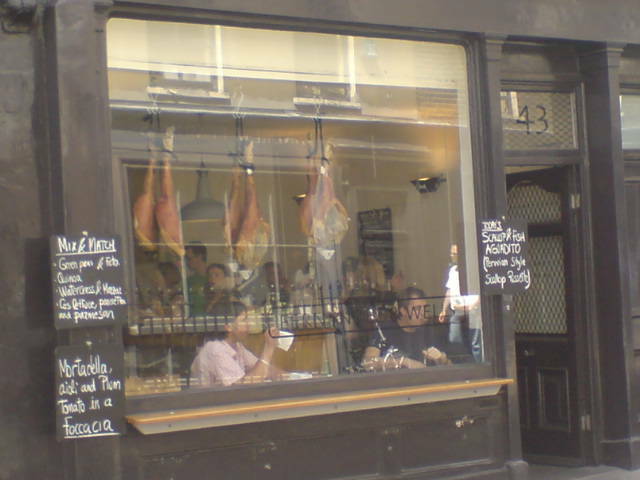 For great tapas and Spanish produce in London, head to Brindisa in Borough market. 2. Burtree puddings made the BEST sticky toffee pudding! 4. The Burren Smokehouse, for the most melt in the mouth smoked salmon you’ll ever taste! 5. Meopham Valley Vineyard, located just 30 miles from central London, and using no herbicides or insecticides on the vineyard, the Pinot Gris tasted lovely! 6. Basque pig charcuterie had three great products to try chorizo, salami and the Saucisse Sèche which we bought and want more of! Thanks to those of you that took part in our Easter poll – it turns out that you couldn’t live without hot cross buns or lamb over the easter period! 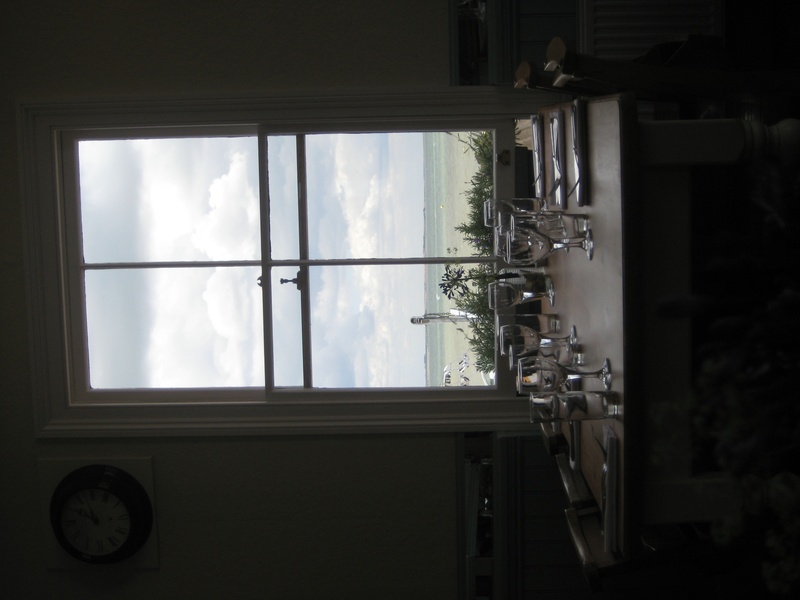 This months foodie inspiration comes from a trip to Pont de la tour – although not the BEST Sunday meal that I’ve ever had in terms of the food, it was certainly a lovely environment with great views and a mouth watering dessert list! Simply add ice to a glass, then fill it with one 5th cordial and top up with tonic water. Very refreshing! I’ve never liked brussel sprouts, but I think that’s because they’ve been over cooked and mushy. Instead of boiling them, try frying some cubes of pancetta in a saucepan, then add the brussels, and three tablespoons of creme fresh, give them a good stir and then leave to simmer for around 15 minutes – deeelicious! We’ve been holidaying in Norfolk, and seeing all of the pheasants around has made me want to cook lots of birdie food and think of Christmas! In addition to pheasant, I’ll be on the look out for partridge, guinea fowl and wood pigeon! 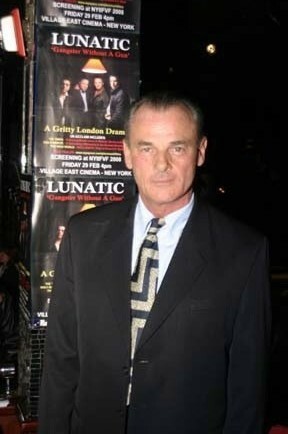 I’ve just been told that this month, our guest blogger is going to be Pie ‘n’ Mash films Director, Bill Maloney. In keeping with the ‘film’ theme, we’ll be showing Bill’s recipe as a video on the site next week – the first ever video recipe to be featured on whatiatelasnight. Tried the Butternut and Gorgonzola soup today (below) and it was delicious. Loads left over to take to work for lunch on Monday too! Highly recommend you trying it. Ocado have a great recipe section on their site and it’s so easy to choose something you want to cook, hit a button and have all of the ingredients delivered to your door. 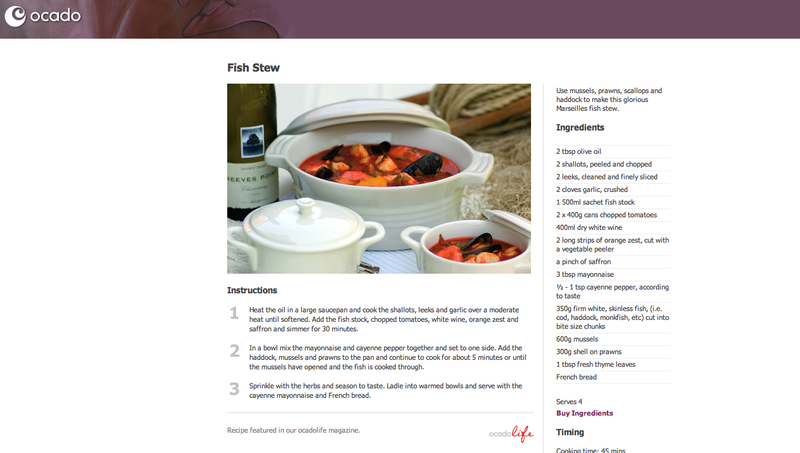 This week I’m liking the look of the fish stew. A weeks holiday to Fornells, in Menorca has inspired me to cook lots and lots of fish! 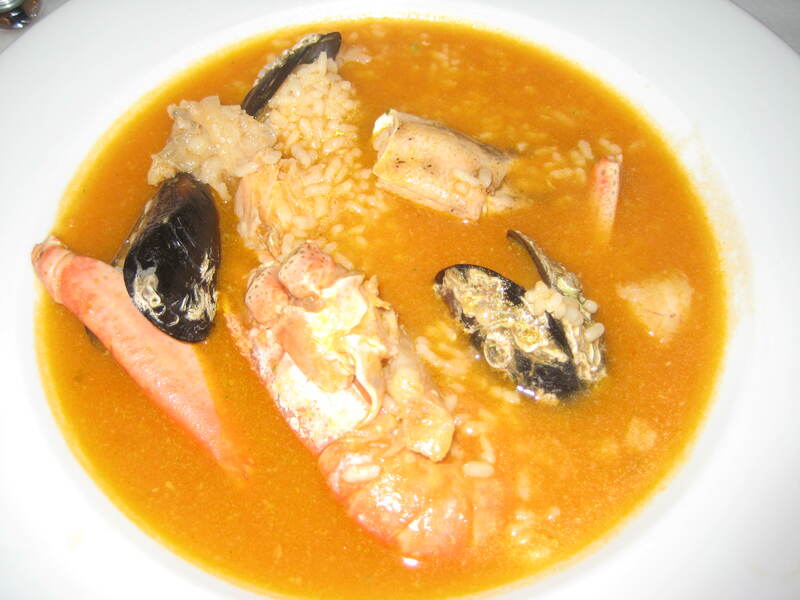 great dishes that we ate in lovely restaurants around the harbour included seafood calderetta soup with rice, seafood platters, octopus and great tapas. 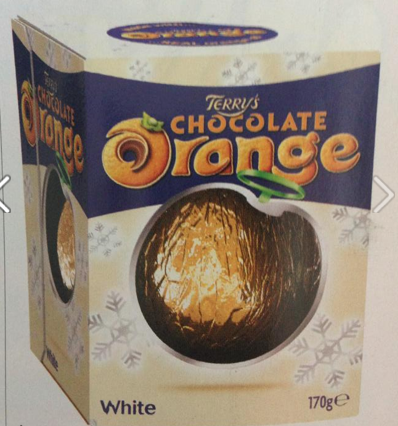 Mmmm…..
Something to try this week…. Chorizo and sausage burgers – idea from Waitrose food website, served in pitta bread with rocket. An idea came to me over the weekend of a dessert that contains half panatone and half strawberries and jelly – a bit of a twist on the original Strawberries and cream. 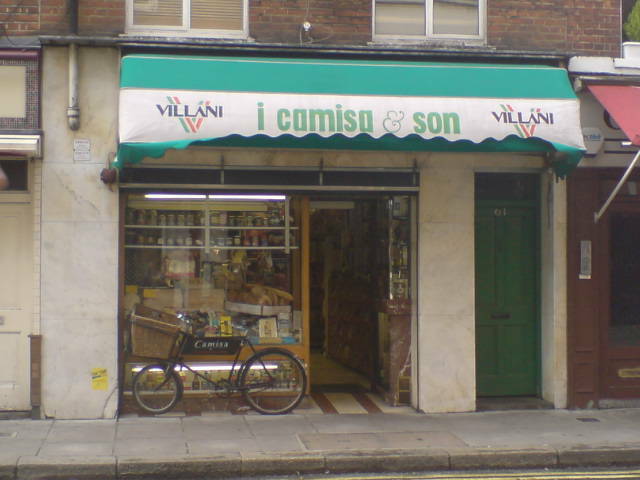 This Italian deli on Frith St in Soho is a great place to go if you want to cook something simple with great quality produce. They make the best home made sauces and fresh filled pasta have the munchiest parma ham and buffalo mozzarella. When you step inside you’d think you were in Italy. Goats cheese mash – eaten at the Pearsons Arms in whitstable. 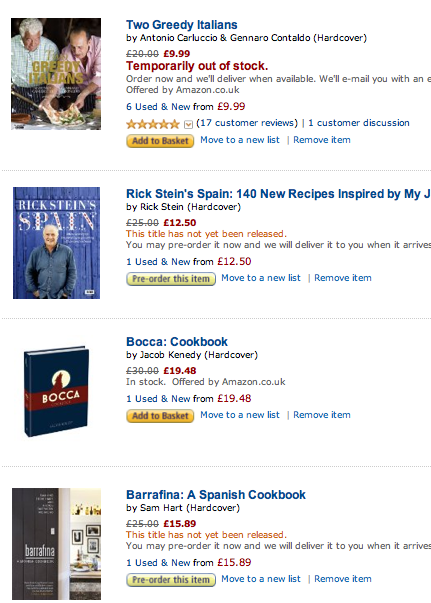 Looking forward to trying out possible meats/fish that it might go well with – other than monkfish wrapped in parma ham. 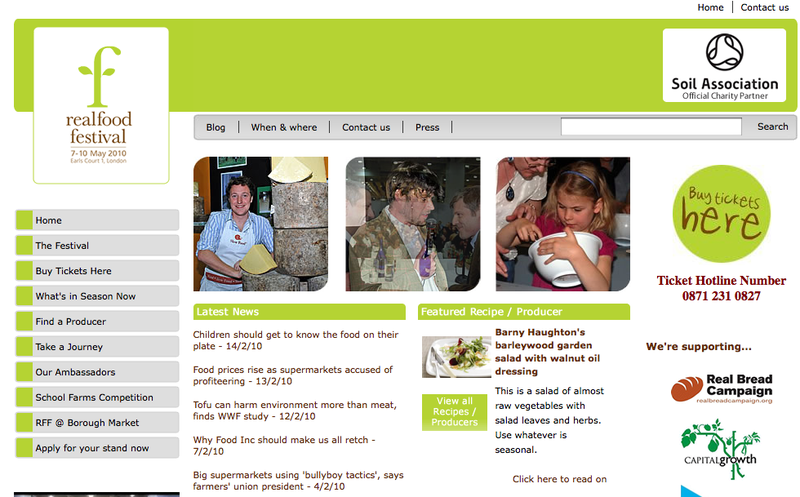 – Great seasonal table on Hugh’s website, I didn’t realise that squid was out of season for so long! I love food and enjoy cooking for friends, family, myself and my dog. 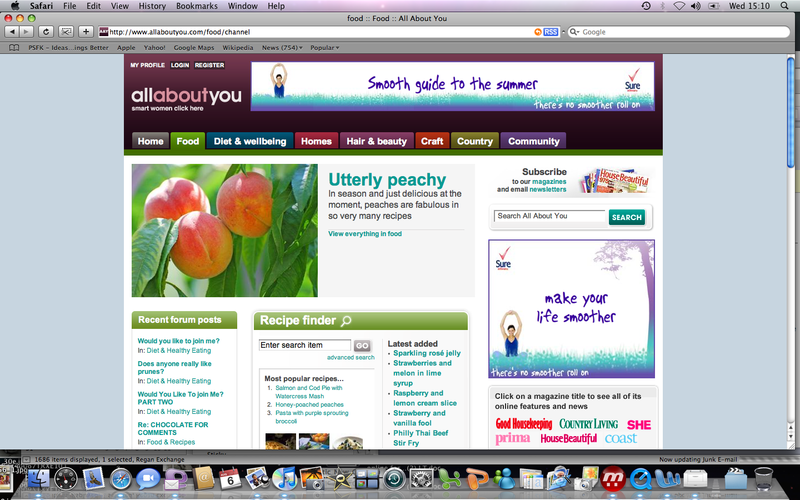 I like nothing more than surfing the net for foodie inspiration, watching cookery programmes and visiting a food market. I’m not a professional cook by any means, but I do try to make a variety of seasonal and healthy food each night and so I thought that I’d share my culinary delights with the rest of the web. 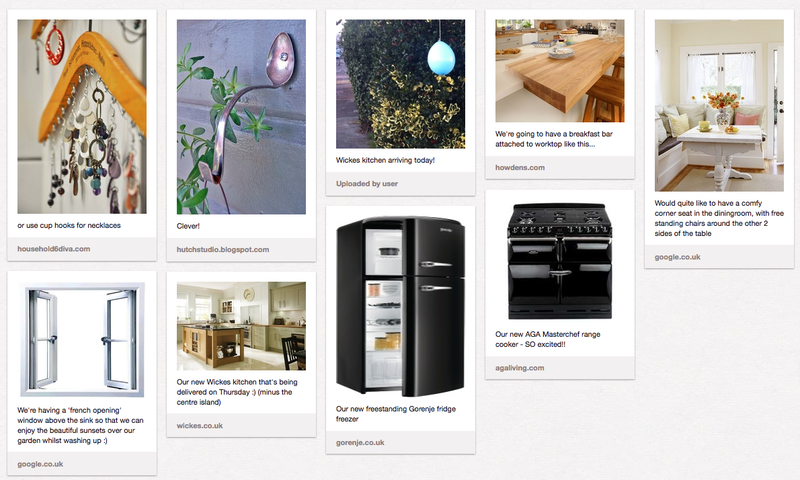 There’s a ‘foodie inspiration’ page showing where i get my kicks and ideas from, and then the main section is full of recipes for people to use/add to.